Today’s young generation faces issues that make it difficult for them to see themselves as being in the prime of their lives. But Lee Joon-ik, the director of “Sunset in My Hometown,” which caps off his “youth trilogy” movies, advises youngsters to go with the flow and maintain a positive attitude. 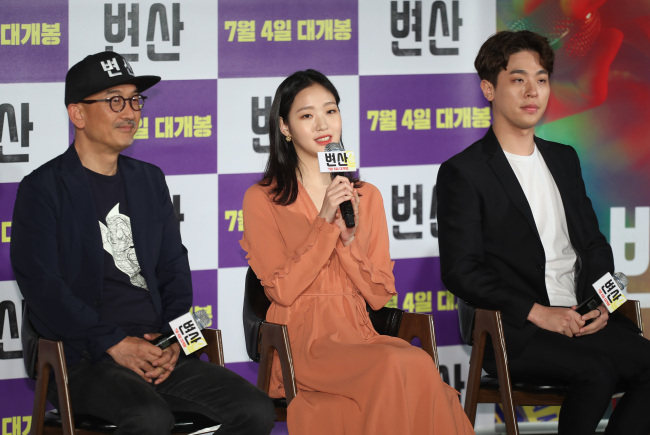 The film follows the life of an unsuccessful rapper Hak-soo -- played by Park Jung-min -- who returns to his hometown of Byeonsan, and to his childhood friend Sun-mi -- played by Kim Go-eun. As Lee pointed out, the reality of the protagonists is no picnic. But Lee said their sincerity toward life would help bring out the positive aspects of their experiences. Park is noted for his character acting -- he has played a broad range of characters, including an independence fighter and a musical savant -- but it required cramming sessions with rapper Yankie to transform himself into a rapper, albeit a unsuccessful one. “I had to rap (in the movie) in front of some of the best rappers in Korea. ... The director asked the rappers over a meal about my skills, and Dok2 said it was ‘good enough for the second round of (the rap competition TV show) ‘Show Me the Money.’ I was so embarrassed,” said Park. Dok2 was one of the judges of the show, and incidentally has a role in the film. Outside of rapping, Park said that Hak-soo’s personality is closer to his actual self than any other character he has played. If Park had to up his mic-checking skills, Kim had to size up on the weighing scale -- 8 kilograms to be exact. “She is very attractive, in that she talks in a way that makes other person think,” Kim added. The other two flicks in the youth trilogy, “Dongju: The Portrait of a Poet” and “Anarchist from Colony,” talked about people in the past. This one talks about people living in the present. “I wanted to depict the ‘now’ of the youth trilogy. I wanted to show that a good ending is inevitable once you persistently come face to face with sincere moments,” Lee said. “Sunset in My Hometown” hits local theaters on July 4.